In addition to scoring his third consecutive number one album and receiving the best album review there is, Kendrick Lamar's DAMN. is charting high on the Billboard Hot chart. After initially debuting at the No. 2 spot upon its release, being stiff-armed by Ed Sheeran's pop tune "Shape of You," Kendrick's "HUMBLE." is now the No. 1 song in the country. This is K. Dot's second time atop Billboard Hot 100, the first being his guest appearance on Taylor Swift's "Bad Blood," and his first ever as a lead artist. But that's not all. As Billboard notes, the entire DAMN. album (no pun intended) is charting, inhabiting 14 positions with "HUMBLE." at No. 1. Elsewhere, "DNA" leads the Hot 100 debuts, landing at No. 4 to give Kendrick his fifth top 10 (and second as a lead act). The music video for the song arrived last week, amassing over 24 million views. "LOYALTY." featuring Rihanna debuted at No. 14, while "ELEMENT." and "LOVE." arrive at No. 16 and No. 18 respectively. 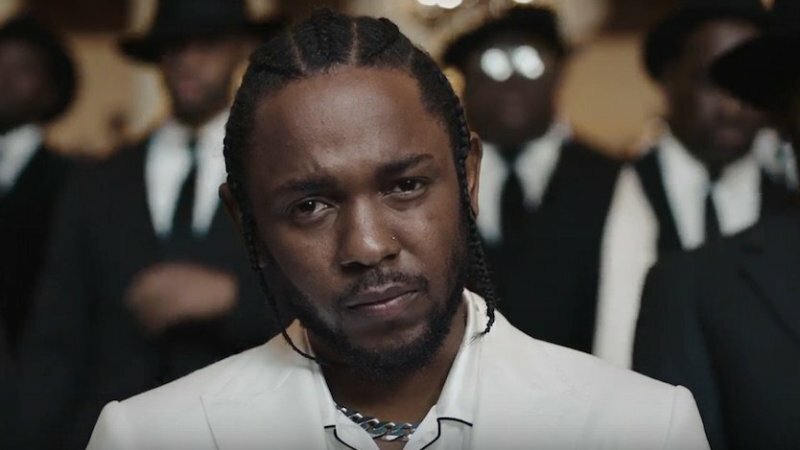 Kendrick is now only the fifth act to chart as many as 14 concurrent titles on the Hot 100. He joins The Beatles, Justin Bieber, Drake and The Weeknd for acts with simultaneously-charted songs off one album.